This opening reception is an opportunity to meet the artists and enjoy refreshments and snacks. This exhibit engages the deeper meanings of transcultural migration to the United States. 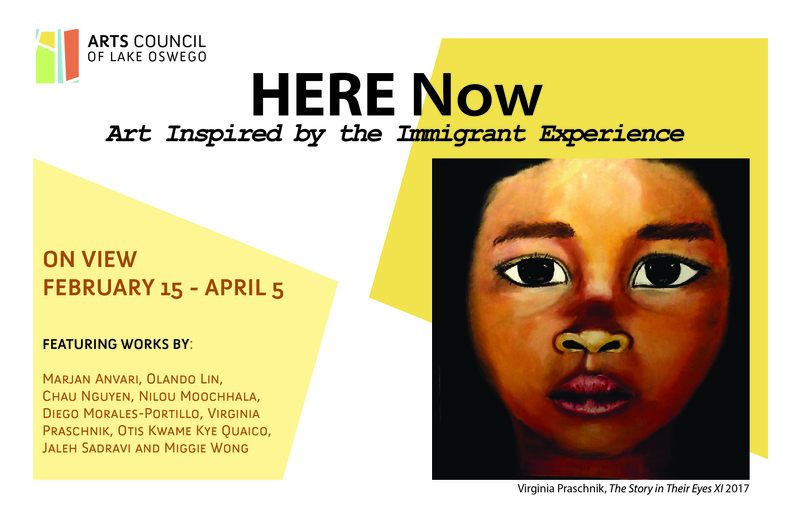 It is an exciting opportunity for a diverse and accessible conversation on US immigration through the artistic lens of those who have immigrated, and now call the US home. Featuring the works by Marjan Anvari, Olando Lin, Chau Nguyen, Nilou Moochhala, Diego Morales-Portillo, Virginia Praschnik, Otis Kwame Kye Quaico, Jaleh Sadravi and Miggie Wong. The exhibition is curated by the Arts Council of Lake Oswego from community-sourced submissions bringing together personal narratives from a wide range of backgrounds.